Checkout out these *POPULAR* Monogrammed 1/4 Zip | New Colors $30.99 (Retail $59.99). 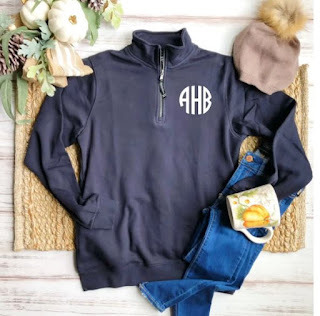 Cute cute cute - monogram love! These pullovers are super soft! Unisex Sizing: Please use the measurement chart when picking your size. See chart in images. These are unisex sized, which means that they run larger than women's sizing. $5.99 for the first item and $3.99 for each additional item. US only. Ships no later than Wed, Feb 13.